We had such a fun afternoon with Meaghan and Dave and their beautiful family in the Saratoga Spa State Park! Take a peek at what Meaghan had to say about our session and her lovely crew…. 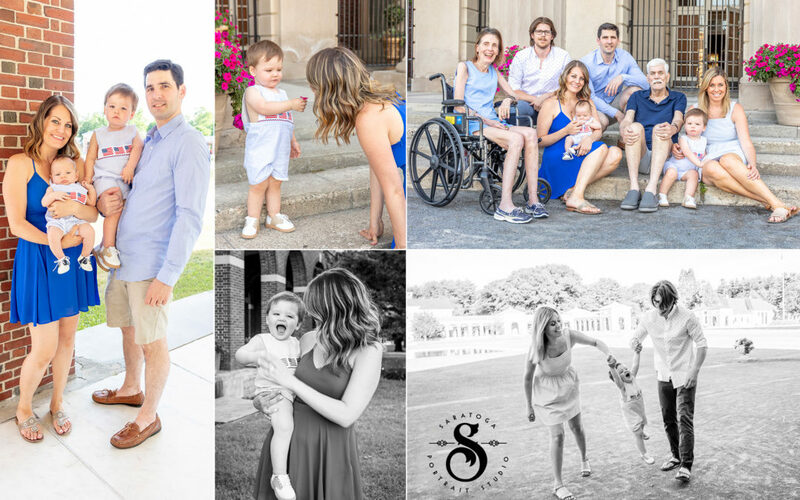 “Three years, two kids and one million memories later… we wanted to introduce our two new additions to our favorite town and thought it was time to contact our dear friends at Saratoga Portrait studio for family pictures. The past few years were nothing short of tumultuous, mom and dad both in and out of the hospital, but nothing boosts morale like time with family. A beautiful afternoon in the park together was just what the doctor ordered. There, Emily, patient and kind, captured beautiful images of us all together, playing in the park. Sheila, the matriarch of the Gilfeather family, suffers from debilitating Multiple Sclerosis. She’s had it for over 25 years now, succumbing to a wheelchair permanently this past year. Her spirit and strength serve as an inspiration to her children, Meaghan, Deirdre and Michael who have all partaken in endurance sports (Meaghan multiple full and half distance triathlons & marathons, Deirdre multiple marathons and half distance triathlon, and Michael hiked the Appalachian trail) in her honor. Michael, banjo playing, Irish music loving father and grandfather, has nothing but love and admiration for his beloved Sheila. He has been suffering from dementia and the disease has unfortunately taken a toll on him as of late. The family wanted to capture loving images of everyone together, for him to look back on.